Is there anything worse than when you’ve finished shaving and it looks like the razor never touched your face? Well, with the Philips Norelco – S9000 Prestige Qi-Charge Electric Shaver at Best Buy you won’t have to worry about that ever again! 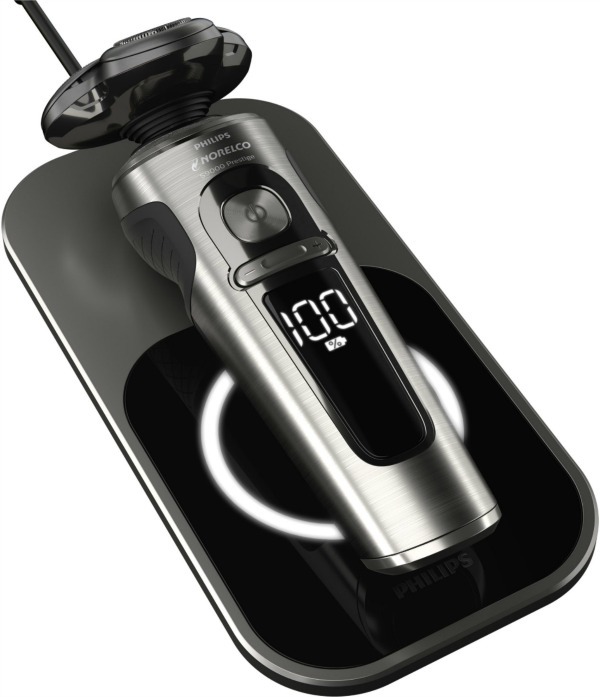 The Philips Norelco – S9000 Prestige Qi-Charge Electric Shaver is Philips best shaver. It gives you the closest shave without the skin irritation and as a result you get less redness and burning. The Philips S9000 Prestige Qi-Charge Electric Shaver gives you plenty of options when you shave. You can shave wet, dry or you can even use gel or foam for an even smoother face! So whether your getting ready to hit the office or your preparing for date night, Philips will help make sure you are looking your best. You can get a close comfortable shave envy with 7 days growth! With the Philips Norelco S9000 Qi-Charge Shaver you can get up to 60 minutes of shave time with as little as a 1 hour charge. Get an extremely close shave with the nanotech precision blades. Strengthened with thousands of nano particles that cut hair with the highest precision, delivering an extremely close shave at skin level. The ContourDetect Heads move in 8 directions to help you get to those hard to shave paces like the neck and jawline. The ContourDetect heads are surrounded with Skin comfort rings. This helps the shaver glide over your skin. The BeardAdapt Sensor allows you to effortlessly shave off even a dense beard. The BeardAdapt sensor checks hair density 15 times per second and automatically adapts the shaver to your hair. Finish off your look with the the skin-friendly SmartClick precision trimmer. It is perfect for trimming up your goatee, mustache or sideburns. The Qi-Charge system allows you to wirelessly charge your shaver. Check out these other posts at the Consumer King.